Bellafill is a unique, injectable collagen filler with microspheres that can instantly smooth facial wrinkles (nasolabial folds) for beautiful, natural-looking correction that lasts. Facial wrinkles are a result of the natural aging process. Over time, the skin loses its ability to repair itself as the underlying elastin and collagen fibers break down and lose its elasticity. 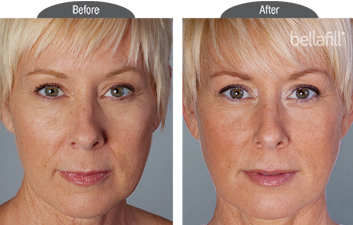 Bellafill is the most distinctive and the most long lasting filler in the world of injectables. The collagen immediately adds volume to the skin to lift wrinkles known as smile lines. The polymethylmethacrylate (PMMA) microspheres create a matrix that supports your body’s own collagen production. Bellafill has been FDA approved for the correction of facial wrinkles since 2006. 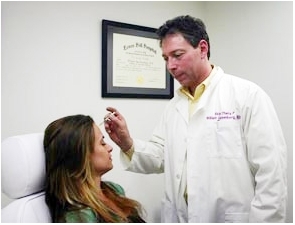 Bellafill requires a skin test to identify patients who may be allergic to the lidocaine or collagen in Bellafill. 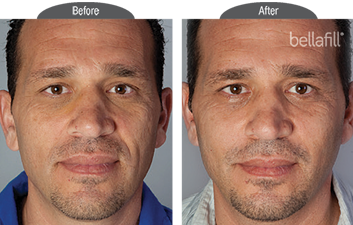 Bellafill isn’t just an exceptional cosmetic treatment option. The injectable gel is comprised of 80% purified collagen and 20% PMMA microspheres. The microspheres are half the diameter of a human hair, so small that they are virtually invisible to the eye. How is Bellafill different from temporary dermal fillers ? All temporary fillers are eventually absorbed by the body. That’s why they require frequent repeat injections. Bellafill is different. The unique microspheres in Bellafill are NOT absorbed by the body. These microspheres provide the support your skin needs for long-lasting wrinkle correction. Now with Bellafill, you can get the lasting wrinkle correction you want in just one treatment. When temporary fillers end, Artefill long lasting benefits continue.